You can get Merona tops for as little as $3 at Target this week. 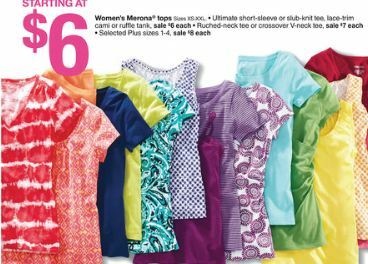 Merona tops are on sale starting at $6 in this week’s Target ad. Stack that with this new $3/1 Merona® Women’s apparel item Target Coupon and get them for only $3! Plus, if you printed the 20% Off 1 Merona Women’s Apparel coupon when it was available, you could get them for $4.80 each. That’s still a great deal!